This paper describes findings of perceptions of tourism managers on knowledge management level in Canakkale. Reviewing the literature on knowledge management, an empirical study was conducted via survey to seek how managers evaluate current knowledge level of their organizations. Items relating knowledge processes, enabling factors for knowledge management culture, technological and socio-cultural issues in organizations were formed. Thus, a holistic way of looking at knowledge management, especially putting the human factors before information technology was sought for. In a rapidly changing work environment, organizations faces the challenge of how to manage its knowledge assets effectively to generate market value and to gain competitive advantage. The focus for knowledge influences everything concerning the organization such as its strategy, products, processes and ways of organizing (Ruggles, 1997; Martensson, 2000; Wiig, 1999). Thus, knowing what to manage as a knowledge is a critical issue. Within this in mind, it is necessary to distinguish between information and knowledge, between information management (IT) and knowledge management (KM). Information can be anything that can be digitised, while knowledge is the capacity to act effectively (Dawson, 2000). Consequently, IT is the management of digitised information while KM includes IT plus all aspects of how people are enabled in performing knowledge-based functions (Dawson, 2000). The debate on IT focused KM and social/cultural focused KM spanning back to 1980s (Warne et al, 2003). Many organisations invest in implementing information technology for providing solutions to manage information resources and knowledge. The dominant picture of knowledge management pays little attention to human and social factors (Thomas et al, 2001). However, paying less attention to people in knowledge processes will not make effective differences. Studies show that less than 25% of IT investments integrate business and technology objectives. In other saying, performance goals are not achieved properly and the causes of such failure stem from the way people using the technology and from the organizational factors (Warne et al, 2003). A study of 431 US and European organisations, conducted by Ernst&Young Center for business Innovation in 1997 (Ruggles, 1997; pp. 86-87) reveals that many companies generally start with implementation of a technological capability that will allow them to capture and share corporate know-how. There is no relationship between IT expenditures and company performance. This is because of the managerial ignorance of the ways in which knowledge workers communicate and operate through social processes of collaborating, sharing and building on each others’ ideas (Lang, 2001). People learn and with the interactions, a shared practice is developed that contributes to the intellectual assets of the organisation, due to Wenger (cited in Warne et al, 2003). Knowledge is much more than information and knowledge sharing is not an information sharing. Considering the knowledge creation as an act of human being, knowledge management systems must involve people and encourage them to think together and to take time to articulate and share information and insights that will be useful to others in their community. Managers must develop appreciation of the intangible human assets captive in the minds and experiences of their knowledge workers (Lang, 2001). As McDermott quoted, “the great trap in knowledge management is using information management tools and concepts to design knowledge management systems” (1999; pp. 104). Companies emphasize important technology and data infrastructure initiatives, but organizational, cultural and strategic changes which are necessary to leverage those investments is ignored or at least most of the organizations fall in this category (Zack, 1999). For Demarest (1997), culture, beliefs and actions of managers about the value, purpose and role of the knowledge; creation, dissemination and use of knowledge within the firm; the kind of expected strategic and commercial benefits of a firm; maturity of knowledge systems; the way of organizing for knowledge; and the role of IT in the KM program are six questions of effective participation in KM. Organisational culture recognizing the value of knowledge allows personal contact that leads to capture tacit knowledge and can be transferred (Davenport & Prusak, 1998). “Values can not be shared electronically or via bits of papers” (Warne et al, 2003; pp. 94). For managing knowledge, effective management of technology and social relations in firms is needed (Bhatt, 2000). In a culture where the knowledge value is recognised, availability of information, sharing of that information, information flows, IT infrastructure, personal networking, system thinking, leadership, communication climate, problem solving, training and many other factors can be supportive factors for successful learning (Warne et al, 2003). For gaining an edge on KM, people – centered skills must be possessed and be used constructively for nurturing and motivating people (Bhatt, 2000). Knowledge is a human act; is the residue of thinking; is created in the present moment; belongs to communities; circulates through communication in many ways; and is created at the boundaries of old, as McDermott describes (1999; pp. 105). Organizational knowledge is social in character. Firms organize and cultivate knowledge to develop core competency or know-how (implicit), and own ability to put know-what (explicit) into practice (Lang, 2001). For successful and viable outcomes of knowledge management, many factors may play important roles. However, some of those are out of influence of the organization while some are internal and can be arranged. Ability to deliver desired service paradigms, ability to act timely, capabilities of employees, innovativeness, work levels links to strategy and direction, ability to creat, ability to solve unexpected issues, effectiveness of enterprise systems, procedures and policies are some of those factors (Wiig, 1999). Culture plays an important role in how KM function is being implemented in organizations Smith & McKeen, 2003). As McDermott (1999) notes, four KM challenges domain involves human interactions. These are technical, social, managerial and personal. The sum total of individual knowledge can be collective knowledge by developing a culture that values knowledge sharing and knowledge creation. It is accepted that organisational learning culture is important for knowledge creation (Bhatt, 2000). The most important aspect of a knowledge management system is the “knowledge community” (Thomas et al, 2001). Knowledge creation can be possible in a shared space for emerging relationships. In other word, for Nonaka and Konno, “ba” or space that may be physical, virtual, mental or any combination of those provides a platform for advancing individual and collective knowledge (1998). If knowledge is separated from ba/place, it turns into information, which can then be communicated independently from ba. Information is tangible and resides in media and networks, however knowledge is intangible and resides in ba (Nonaka & Konno, 1998). The effective creation of new knowledge, especially tacit knowledge, hinges on strong caring relationships among the members of an organization (Lang, 2001). Sharing tacit knowledge can be possible through joint activities such as being together, spending time, living in the same environment, known as socialization stage for knowledge conversion (Nonaka & Konno, 1998). Knowledge management efforts must focus more on tacit knowledge and experiment with new organizational forms, cultures and reward systems to enhance interpersonal interaction and social relationships (Lang, 2001). Human relationships are themselves a function of the organizational culture (Lang, 2001). Knowledge is manageable only when leaders embrace and foster the dynamism of knowledge creation. Top management acts as the providers of “ba” for knowledge creation (Nonaka & Konno, 1998). Lack of support from senior management, specifically visionary, moral and fiscal resources, KM efforts cannot be successful. Top management must realise that knowledge needs to be nurtured, supported, enhanced and cared for. What they should consider for enabling knowledge creation is to think in terms of systems and ecologies which can provide for the creation of platforms and cultures where knowledge can freely emerge (Nonaka & Konno, 1998). Knowledge management efforts lack of strategy link and even it is not a key evaluation criterion or motivating factor (Ruggles, 1997). Decisions are made in a context including a business strategy along with a set of experiences and skills, a culture and structure, and a set of technology and data. In an organization, in creating value, people can use their competence externally or internally. External structure consists of relationships with customers, suppliers and the image of the firm. Internal structure consists of patents, concepts, computer, administrative systems, models. Internal networks culture also belongs to the internal structure (Sveiby, 2000). Successful knowledge strategies can be as those: explicit and clear links to business strategy- value adding knowledge; knowledgeable about knowledge; a compelling vision; knowledge leadership; systematic knowledge processes as capturing external/internal knowledge, organizing and sharing knowledge; well-developed knowledge infrastructure; appropriate bottom line measures-i.e. measuring knowledge contribution (Skyrme, 1998). Business organizations view knowledge as their most valuable and strategic resources. To remain competitive, they know that they must manage their intellectual resources and capabilities. Integrated focus of technical and organizational initiatives together –i.e. IT-supported KM (Gottschalk, 1999) can provide a comprehensive infrastructure to support KM processes, but it is not the guarantee for investments and objectives of the firms (Zack, 1999). A knowledge strategy is needed to fulfil the mission to strengthen competitive position and to create shareholder value. Knowledge management must linked to the creation of economic value and competitive advantage (Zack, 1999). Organizations must strategically assess their knowledge resources and capabilities. What they know and what they must know are the crucial starting point to play the game. Every firm’s strategic knowledge can be categorised by its ability to support a competitive position. There can be core knowledge, advanced knowledge (competitive viability) and innovative knowledge (leading leadership of the industry) (Zack, 1999). An understanding of the knowledge nature is imperative, allowing the environment which is supportive for the generation of knowledge, storage, coordination and diffusion, thus resulting in a core competence influencing competitive advantage (Stonehouse & Pemberton, 1999). Competitive advantage is based on firm specific core competences (Prahalad & Hamel, 1990). Core competences are combinations of resources and capabilities unique to a specific organization and generating competitive advantage by creating unique customer value. Core competences may be based upon knowledge of customers, knowledge of technology, knowledge of processes, and etc. (Stonehouse & Pemberton, 1999). An organization’s effectiveness at its core knowledge processes depends on its capabilities of dealing with knowledge- i.e. knowledge capabilities. For developing knowledge capabilities, individual and organizational technology, individual and organizational skills and behaviours must be addressed (Dawson, 2000). Converting knowledge into core competence and competitive advantage essentially depends on sharing and co-ordinating knowledge within the organization and with collaborating businesses (Stonehouse & Pemberton, 1999). As the result, knowledge management should be linked to the building blocks of it, namely, mission, structure, culture, strategy, style of management, personnel, systems and finally the instruments used to manage the tacit and explicit knowledge (Beijerse, 1999). As an answer to question of what kind of knowledge to be managed is the knowledge that is usable those are current (strategy and performance in terms of existing and potential), relevant (What is in it for me?) and actionable (concerning processes) (Bailey & Clarke, 2001). In other word, to manage knowledge successfully, a cultural, organizational and technical infrastructures that enable knowledge process to take place are required (Demarest, 1997). Considering the literature debates on KM, the goal of this study is to investigate KM perceptions of tourism managers in Canakkale. The basic research method of the study was a face-to- face survey of managers selected from the population. Since tourism activities are primarily service works that require quicker, flexible solutions because of its human-intensive nature on each side- i.e. service frontiers contacts with consumers, competences of personnel can make differences. However, without enabling factors, a person cannot make difference at great amount in serving. So, organizational culture that serves them to make better will definitely be fundamental enabler for successful service. A well -equipped and competent person can make difference this time. For the reasons concerning tourism works given above, tourism managers were targeted as they were the providers of the knowledge management system in those organizations. Since there were only few travel agents in the region, agents were not included in the research sample. Managers from hospitality firms and food & beverage firms were surveyed. 21 items were developed concerning KM and responses were asked in 5 points likert-type, ranging from 1 (totally agree) to 5 (totally disagree). Meanwhile, managerial position, gender and level of education were asked in a structured form. Managers filled in questionnaire forms at their sites in face- to- face context. Considering the literature review, four KM categories were created. One of them is directional that give way organization to have its route as competitive focus, competitive use, customer focus and strategic focus. Cultural category includes creative, innovative and learning perspectives. Since learning is an human act, the third category was labelled as human resource issues, including IT training, teamwork and participation, communication, education and orientation. And finally, to see how the knowledge is embedded in processes of knowledge, process category including access, storage, use and share of knowledge was considered. The frequencies of all the variables, sub-categories of the variables and explanation of all the abbreviations used in the analysis are given in Table I. The reliability of the items is 0,8417 (alpha coefficient) indicating high reliability. In the study, to present a clearer graphical map, 5-point Likert response categories were recoded and reduced to three categories as agree, partly agree and disagree, and only two-dimensional solutions were used. The obtained data were analysed in SPSS Package Version 8.0 that contains PRINCALS version 0.6. For the purpose of the study, non-linear principal components analysis (PRINCALS) was conducted to see the relationships among variables assuming the relationships as non-linear. As it is known, PRINCALS allows to treat variables as numeric, ordinal or nominal variables (Konig, 2002; Michailidis, 1996). “Non-linear principal components analysis searches for an optimal mean squared correlation between the variables recoded by the category quantifications, and the components. In the search for optimal mean correlations between the recoded variables and the components, both the component loadings and the category quantifications are varied until the optimum is found” (Konig, 2002; pp. 116). Briefly, PRINCALS is a non-linear technique for detecting relationship within a group of numerical or categorical variables (Heijltjes & van Witteloostuijn). It stands for “PRINcipal Component Analysis by means of alternating Least Squares” and was set forth first by Rijckevorsel and de Leew in 1979. It has a wider range of application since it allows not only nominal variables, but also ordinal and numerical variables. It can also treat nominal variables with single or multiple quantification (Van de Geer, 1993). On the other hand, as Gifi (1991) mentioned, PRINCALS accepts multiple nominal since it is based on meet loss, whereas other programs are based on join loss. The relationship between variables is assumed as non-linear. Data to be used in the analysis should be positive. Zero or minus values are not considered in the analysis. Moreover, only one set of variable is used. In the case of more than one set of variables, non-linear canonical correlation analysis (OVERALS) is used. PRINCALS allows graphical display of considered variables on a two-dimensional map. Objects of the same category locate closer whereas objects of the different categories locate in far distance. Eigenvalue for dimension 1 and dimension 2 are 0,23 and 0,08 respectively. These eigenvalues can be interpreted as the square of canonical coefficients between object scores and optimally quantified variables in the case where no missing data exist. However, the above given eigenvalues are not so strong for total fit. Component loadings for the whole variables are presented in Table-II numerically and in Figure–1 graphically. Component loadings show correlations between object scores and rotated variables. Gender (Gen) and Type (Typ) were found as located at the centre. Component loadings located on first dimension were found to be negatively loaded except Position (Pos) and Education (Edu). Component loadings show that the higher the value on a dimension the better the variable is weighted on that dimension. p5 access, p6 measure, p7 use of knowledge, p8 use of knowledge. H denotes human factor items: h1 IT training, h2 teamwork, h3 communication,h4 education, h5 orientation, h6 voluntary participation. C denotes culture items: c1 creative culture, c2 learning culture, c3 innovative culture. D denotes direction items: d1 customer focus, d2 competitive focus, d3 competitive use, d4 strategic focus. Components loadings p2, c1, c2, p6, h2, d2, p7, d3, p8, d4 and c3 are represented better by dimension 1, and p4 is represented better by dimension 2 while p1, p3, h3 and h6 variables are represented by both dimensions. On the other hand, p1, p2, p3, p4, d1, h4, h5, h6, d4, and c3 variables were found to have same directions and closely correlated. h1, p5, c1, c2, p6, h2, h3, d2, p7, d3 and p8 variables were found as being changing in the same directions together. In order to determine homogenous groups of tourism managers due to their perceptions about sub categories of variables, PRINCALS was conducted. Groups formed were presented in Figure 2, graphically, and their coordinates on the dimensions were given in Table III, numerically. As it can be seen, four homogenous groups were obtained. The formation of groups were set according to the responses of the participants. In other word, the relationship between the sub-categories of variables and the sub-categories of knowledge management items given in the questionnaire has determined the formation of the groups. These groups are as follows. The first group or cluster consists of p5 (pa and da), p6 (pa and da), p7 (pa), p8 (pa), c2 (pa), h1(da), h2 (pa), h3 (pa), d2 (pa) and d3 (pa) . The second cluster consists of p3 (da), p4 (pa and da), h4 (pa and da), h5 (da) and h6 (pa) . The third cluster consists of p1 (a), p2 (a), d1 (a), d4 (a), h5 (a and pa), h6 (a) and c3 (a). The fourth one consists of p5 (a), d2 (a), d3 (a), c1 (a), c2 (a), h1 (pa), h2 (a) and h3 (a). The first group shows that knowledge access, measuring, use of knowledge, learning culture, IT use training, teamwork, communication, competitive focus and competitive use of knowledge form a group having partly agreement and disagreement which means that lack of these factors come together that may support the third and the fourth group formation. The second group shows that IT use, knowledge sharing, education, orientation and voluntary participation come together with their partly agreement or disagreement which also support the third and the fourth group formation result. These two groups can be combined to have one group since both groups have similar perceptions concerning the mentioned variables (left hand-side of Figure-2). The third group shows that knowledge access, storage, customer focus, strategic focus, personnel orientation, voluntary participation, innovative organizational culture are available in organizations. The fourth group shows that knowledge access, competitive focus, competitive use of the knowledge, creative and learning culture, IT use training, teamwork and communication factors co-exist in these organizations. Combining these two groups may be more meaningful to explain the existences of effective knowledge management level( right hand-side of Figure-2). In this study we have firstly presented the literature debates on IT-focused KM and cultural KM. In a next step, we conducted a survey containing items about KM- related factors as process, direction, human resource and culture. It was expected to see the level of overall KM perceptions of tourism managers in a narrower geographical area where the competition is not so intense. Tourism managers should keep in mind that tourists possibly faces higher level service offerings in more competitive destinations before coming to this site. On the other hand, in a globalised world, the expectations of both parts are influenced greatly. Thus, the perceptions of managers at all levels in organizations concerning knowledge and knowledge management factors will give directions to better level for exploitation and exploration of knowledge management. Looking at the results of the research, we see that two distinct groups form heterogeneously, or four groups forms homogeneously according to the perceptions of managers. Managers who agree that the given expressions or statements are valid for their organizations form a group (third and fourth groups). Agreement category include knowledge access, knowledge storage in terms of process, innovative culture, creative culture and learning culture in terms of culture, strategic focus, customer orientation, competitive focus and competitive use of knowledge in terms of direction, and finally participation and teamwork, training, communication in terms of human resource perspective. However, managers who partly agree on orientation also fall in this group. On the other hand, managers who disagree on training, use of knowledge, orientation and managers who partly agree on use of knowledge, learning culture, teamwork, participation, communication, competitive focus and competitive knowledge use form a group. An other important finding of this study is that general managers and middle level managers due to their organizational position take part in group where partly agreement and disagreement are grouped. Supervisors on the other hand as a position sub-category stands far from each group. In terms of education, Lycee level take part in group 2. Graduate and post-graduate level stand near third group but is located out of it. Primary and secondary education levels also stand far from each groups. 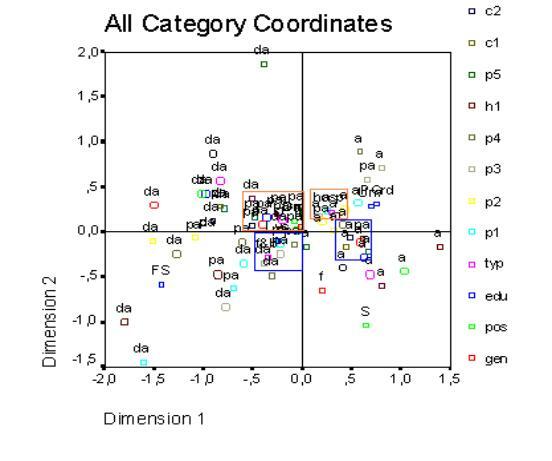 Meanwhile, as mentioned before, gender and firm type locate at the centre. Gender makes no difference and doesn’t play important role on the knowledge management perception of managers. Type of tourism firm as hospitality and food & beverage also makes no difference on the perception of managers. Perception of supervisors is different from general managers and departmental managers. This means that managerial position plays role on perceptions. This can be the sign of weak knowledge culture. Managers who are agree on knowledge management dimensions in their firms form a group, however some of the dimensions, namely the knowledge measurement, use of knowledge, knowledge sharing and education are excluded. In other word, managers who are agree on these dimension are not homogeneous with the managers those agreeing on other dimensions. Indeed, this finding is not congruent with the previous theoretical assumptions. As a final word, tourism managers of Canakkale generally are aware of knowledge management factors. This can be seen as the entrance step to make a change in their firms to benefit from knowledge management since the human and cultural side of knowledge management is very crucial in service firms and specifically in tourism firms. Bailey, C. & Clarke, M. (2001), “Managing knowledge for personal and organisational benefit”, Journal of Knowledge Management, Vol.5, No.1, pp.58-67. Beijerse, R. P. (1999), “Questions in knowledge management: defining and conceptualising a phenomenon”, Journal of Knowledge Management, Vol.3, No.2, pp.94-109. Bhatt, G.D. (2000), Information dynamics, learning and knowledge creation in organizations”, The Learning Organization, Vol.7, No.2, pp.89-98. Coulson-Thomas, C. (2000), “Developing a corporate learning strategy”, Industrial and Commercial Training, Vol.32, No.3, pp.84-88. Davenport, T.H. & Prusack, L. (1998), Working Knowledge: How organizations manage what they know, Boston, MA: Harvard Business School Press. Demarest, M. (1997), “Understanding knowledge management”, Long Range Planning, Vol.30, No.3, pp.374-384. Gottschalk, P. (1999), “Use of IT for Knowledge Management in Law Firms”, The Journal of Information, Law and Technology (JILT), http://elj.warwick.ac.uk/jilt99-3/gottschalk.html. Gifi, A. (1991), Nonlinear Multivariate Analysis, England: John Wiley & Sons. Heijltjes, M.G. & van Witteloostuijn, A. “Configuration of Market Environments, Competitive Strategies, Manufacturing Technologies and Human Resource Management Policies”, NIBOR/RM/96/07, Available at http://www.edocs.unimaas.nl/files/nib96007.pdf. Konig, R. (2002), “On the rotation of non-linear principal components analysis (PRINCALS) solutions: Description of a procedure”, ZUMA-Nachrichten 50.jg.26, pp.114-120. Lang, J.C. (2001), “Managerial concerns in knowledge management”, Journal of Knowledge Management, Vol.5, No.1, pp.43-57. Martensson, M. (2000), “A critical review of knowledge management as a management tool”, Journal of Knowledge Management, Vol.4, No.3, pp.204-215. McDermott, R. (1999), “Why information technology inspired but cannot deliver knowledge management”, California Management Review, Vol.41, No. 4, pp.103-117. Michailidis, G. (1996) “Multilevel Homogenity Analysis”, Theses &. Dissertations, Paper No.2, UCLA Statistics Program, http://www.stat.ucla.edu/thesis/index_body.php. Consulted in October 2003. Nonaka, I. & Konno, N. (1998), “The Concept of “Ba”: Building a Foundation For Knowledge Creation”, California Management Review, Vol.40, No.3, pp.40-54. Powers, V.J. (1999), “Xerox Creates a Knowledge-Sharing Culture Through Grassroots Efforts”, Knowledge Management in Practice, No.18, pp.1-4. Probst, G., Raub, S. & Romhardt, K. (2000), Managing Knowledge- Building Blocks for Success, West Sussex: John Wiley & Sons, Ltd.
Prahalad, C.K. & Hamel, G. (1990), “The core competence of the corporation”, Harvard Business Review, May-June, pp.79-91. Ruggles, R. (1997), “The State of the Notion: Knowledge Management in Practice”, California Management Review, Vol.40, No.3, pp.80-89. Smith, H.A. & McKeen, J.D. (2003), “Knowledge Management in Organizations: the State of Current Practice”, KBE Queen’s Centre for Knowledge-based Enterprises, Working Paper, WP 03-02, Ontario. Stonehouse, G.H. & Pemberton, J.D. (1999), “Learning and knowledge management in the intelligent organisation”, Vol.7, No.5, pp.131-139. Thomas, J.C., Kellogg, W.A. & Erickson, T. (2001), “The knowledge management puzzle: Human and social factors in knowledge management”, IBM Systems Journal, Vol.40, No.4, pp.863-884. Van de Geer, J.P. (1993), Multivariate Analysis of Categorical Data: Theory, California: Sage Pub. Warne, L., Ali, I.M. & Pascoe, C. (2003), “Team Building as a Foundation for Knowledge Management: Findings from Research into Social Learning in the Australian Defence Organization”, Journal of Information & Knowledge Management, Vol.2, No.2, pp.93-106. Wiig, K.M. (1999), “What future knowledge management users may expect”, Journal of Knowledge Management, Vol.3, No.2, pp.155-165. Zack, M.H. (1999), “Developing a Knowledge Strategy”, California Management Review, Vol. 41, No.3, pp.125-145. Assist. Prof. Murat GÜMÜŞ received his B.S. in Communication Arts from Anadolu University, Eskişehir, and became a research assistant at Canakkale Onsekiz Mart University in 1993. He received his Master of Management & Organization, and his Ph.D. of Business Administration from Uludağ University, Bursa. He promoted as Assistant Prof. In 2001. His study topics are Organizational Behavior, Knowledge Management, Intercultural Communication, and TQM. Lecturer Bahattin HAMARAT received his B.S. and Master of Science in Statistics at Anadolu University, Eskişehir. He attended to the same university as lecturer. He then moved to Canakkale Onsekiz Mart University as a lecturer.